Many years ago I would do a training with special education teachers and I would always ask, “What is Your Curriculum?” Often times I found that the teachers could not tell me what their curricula were. Those who did tell me, often told me that their curriculum was their students’ IEPs. Unfortunately, IEPs are not intended to be, and really can’t be, used as a curriculum. I think in recent years we have all been made a bit more aware of what curriculum is, but there is still some confusion about whether curriculum is the materials or the scope of instruction. In addition, curriculum is a really difficult topic for special education, especially when it involves teaching students whose skills are significantly lower than other students their age. So, I wanted to do some posts talking about what curriculum means, covering some of the more common ones we may or may not know about, and talking about why having a curriculum is important. 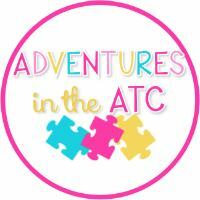 So, when my friend Nicole from Adventures in the ATC asked if I would like to team up for some posts about curriculum, I jumped at the opportunity. For the next 3 weeks, Nicole and I will each be bringing you posts about curriculum on Wednesdays. 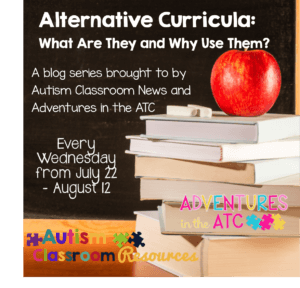 Today we are kicking off talking about what curriculum is, so I thought I would focus on what it is, and what it’s not, as well as why that is important. Now, I know this is not a great poolside topic for summer, but I will try to keep it on point and useful. Curriculum is a scope and sequence of instruction. Boy that sounds academic. Curriculum is essentially what tells you what to teach and when to teach it. It’s a set of skills, sometimes based on developmental norms, sometimes linked to state standards or core standards, and sometimes not. Sometimes it includes the materials and strategies to teach the skill (think Edmark or PCI Reading) and sometimes it doesn’t (think the core standards or your state’s general education standards). General educators usually don’t have to think a whole lot about what curriculum they are going to use because they are required to teach the state standards and the school system usually adopts the textbooks and materials to be used. While special educators are expected to teach the general education standards, often those standards are not sufficient for our students. Many of our students have needs outside the regular curriculum. Whether it’s higher functioning students who need social skills instruction or more complex learners who need functional skills, neither of those areas are covered in most state curricula. So, we are often left on our own. There is the vanilla, which is the overall scope and sequence that needs to be taught. The general education standards are one form of this. Curricula that tie into them, like the Unique Learning System (ULS) which I will talk about later in the series, are a specialized version of an overall curriculum. The Assessment of Basic Language and Learning Skills (ABLLS) and the VB-MAPP (both of which Nicole will talk about in coming weeks) are another version of this for younger students. In many states there are extended standards or alternate standards for students who receive alternate assessments. These standards help to adjust the general education standards to focus on the part of the skill that the students with special needs should learn. In some states, it’s a case of modifying the standard, and most are required to teach and assess these standards for these students. However, there is still a need for other types of curriculum that I’ll talk about below to supplement them. For instance, naming a the Civil War battlefields in a state is probably not a functional life skill for living independently, but it a social studies extended standard in one of the states. It’s an attempt to take the general education standards and modify them but keep their intent. However, many of our students need skills outside the typical curriculum. Then there is chocolate, which is the overall scope and sequence if you are teaching a functional or life skills curriculum. These are much harder to find and more difficult to choose but I will cover a couple options later in the series. Essentially this is a scope and sequence that takes you from basic skills to the skills a student needs to live and work independently. Preferably, since it is not based on developmental norms, it would be based on a tested scaffolding outlining the skills is a reasonable order. One curriculum I used to use that is not available commercially, unfortunately, took the skills that clients living in groups homes needed to live independently and task analyzed them backwards from highest down to lowest skills. This flavor of curriculum is an overall scaffolding of skills, similar to the vanilla flavor, but just a bit more specialized. Then there is pistachio, that is much more focused on a specific skill. This is often the type of curricula we talk about when you hear “scientifically based curriculum.” This is a free standing curriculum that ties into an overall standard but focuses just on teaching one subject. So, PCI Reading is a reading curriculum that is scientifically based. Touch Math is a math curriculum that many of us use. Currently most states have a list of acceptable scientifically based curricula that schools can tap into, in part because they had to develop it for students without disabilities who weren’t learning within the overall general education curriculum. 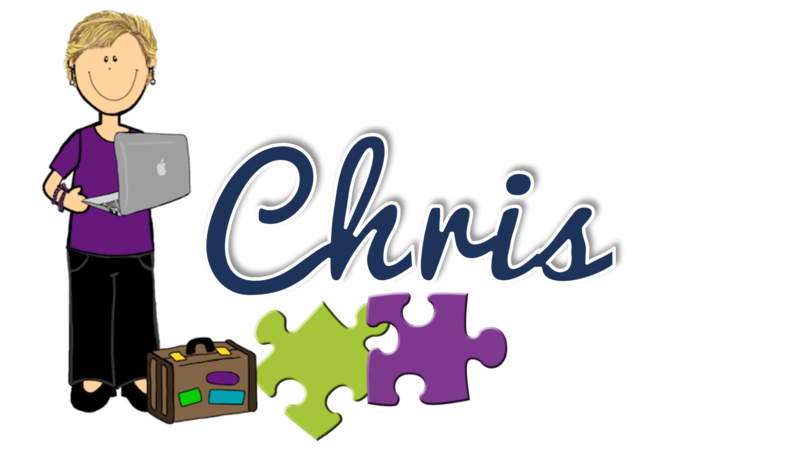 Nicole and I are going to focus on the Vanilla and Chocolate Curricula options that are out there for special education. However, if there are curricula you would like to know more about, please share them in the comments and I will post about them or find someone to do a guest post about them who has more experience. I know this will confuse and possibly upset some people, but it’s critical to understand (for both family members and for teachers). The IEP is designed to target specific individual skills that a student needs to learn. This is pretty straightforward if the student has a reading disability. He would have reading goals in his IEP to target strategies and skills in that area. However, just because he doesn’t have math skills in his IEP doesn’t mean he isn’t taught math. Similarly just because every reading skill isn’t in his IEP doesn’t mean he isn’t working on other reading skills. We would never say that a student with a reading disability’s curriculum was his IEP (at least I don’t think we would). And yet we say it all the time about our students who have more significant needs. If we were to write in the scope and sequence of everything any student needed to learn in an IEP the document would be even more epic than some of them are (because many of our kids have complex needs) and the meetings would be even longer. A while back I wrote about writing enabling goals–goals that are designed to help the learner access the curriculum. For students who are off-roading in the world of curriculum, I think enabling goals make the most sense. You can read more about what that means in this post. Again this is one of those statements that some won’t agree with. Curricula can include the materials you need to teach a skill, but just having the materials is not the same as a curriculum. I get concerned about this misconception primarily because so many people market and say they “create their own curriculum.” It always happens–I ask training audiences about what curricula they use for a certain subject and someone or many people tell me they create their own. While it is definitely possible to create your own curriculum, it’s unlikely that when someone says that they mean they are creating a scope and sequence. Also, one always has to ask has the curriculum been tested and validated as a scope and sequence. Usually they mean they find and develop materials that teach specific skills. How do we know what specific skills to teach? That is what we need the Vanilla, Chocolate or the Pistachio curriculum for–to tell us what to teach. Then we can pull materials in to teach those specific skills. Without that scaffolding we are likely to forget key skills, miss key skills, or teach skills out of order in a way that compromises the student’s learning. I know that curriculum is a term frequently used to describe the activities of teaching. However, I think that use can be confusing. Trust me, we still need lots of materials to support our curricula because many of our students can’t just use curriculum that are at their developmental level. A second grader might be able to make a set of materials I made for money skills for a high school student with disabilities working on a functional curriculum. However, that high school student should not have to automatically use the same thing that second graders use to learn–for many reasons. The materials are often not age-appropriate for a high schooler, but even more there probably are not as many practice opportunities in a second grade material as the high schooler needs to master the skill. We will still be developing and drawing from materials to teach the curriculum, as I have yet to find a curriculum (scope and sequence) that gives us ALL the materials we need to teach. However, we need to make sure we know the scope and sequence of what we should teach to students. Thankfully, there are finally some options out there for students with special education needs–as always there are more for younger students than older. However, over the next few weeks, Nicole and I will be reviewing some of the more common curricula available. If you have one you would like us to include or review, please leave me a comment and I will definitely blog about it during or after the series. And I would love to hear from you about your questions regarding curriculum. It’s a complicated topic, but it doesn’t have to be. Nicole and I will be back next Wednesday with reviews of different curricula. In the meantime, click on her button below to hop over to her post about curriculum. In the meantime, don’t forget to make sure you enter the giveaway on my previous post–it is open until July 26–to win a set of schedules/visuals as well as 1-1 consultation for setting up your classroom. I will be back Friday with another post in the Effective Interventions in ABA series. I’d really like to hear your thoughts about a good math curriculum for students with special needs on alternate standards. I would like to hear about the Creative Curriculum. I teach in an inclusive preschool classroom and my district is adopting this curriculum this school year. Thank you! Thanks! I will definitely put that on the list. I find it difficult to use for most of our more complex students but will definitely include it in a post. Will you be covering brigance? One of us definitely can or I will cover it after our series is over. I think Nicole may have it on her list but I’m not sure. I will definitely include it. Thanks for commenting! NC has extended standards of the common core. At my school even those extended standards either are past the scope of the students’ abilities or are not functional for daily living and independence. Thus, we are in the process of breaking down the extended standards of the common core in to I can statements. NC is piloting Dynamic Learning Maps for testing and a curriculum in a couple of schools. Have you heard of this and what are your thoughts. I am not familiar with them, but I have a friend who works in NC and might know more about it and can share her thoughts. I’ll check with her and get back to you. We started using Attainment last year and it’s not bad for math. The ELAR curriculum has doe good elements but needs more phonics/foundational skills. Interesting…I’ve used Attainment for individual skills before but am not as familiar with the full curriculum. Thanks so much for sharing that! You’re blog and teaching plan are really helping me refine my planning for the upcoming year (which starts in a week!) In the past, I’ve made program binders for my students with DTT programs run in 1:1 instruction. While I teach in substantially separate classroom, all my students participate in inclusion with the gen ed classroom for varying amounts of time; some for 30 minutes total, others for half the day. I am wondering how much I should focus on a separate curriculum for my students versus differentiating the gen ed curriculum. There seems to be a push in my state to move away from substantially separate and different curricula for the more significantly disabled students. I can’t figure out how to balance the amount of time it takes to differentiate versus finding and teaching a separate curriculum within my classroom. Do you have any information or thoughts on the Styer-Fitzgerald Curriculum/Materials for students with significant cognitive disabilities? Also, a follow-on program to Edmark once Level 2 is mastered? Major struggles here in Georgia to find something appropriate…. Jocelyn, I’m not familiar with Styer-Fitzgerald. But for follow up to Edmark, try the Functional Word Series from Edmark or try the PCI reading series. Those would be good follow ups for it. You mentioned a curriculum you used to use that is not available commercially, it took the skills that clients living in groups homes needed to live independently and task analyzed them backwards from highest down to lowest skills. What was the name of this curriculum? Thanks!